Yes, its that time a year again. The time we go into the attic and pull down the Christmas lights and ornaments. It is the time we go to our local retail store and hear Christmas tunes from the past. This year, however, it is also a time to start learning some of your favorite holiday tunes on the banjo, mandolin (fiddle) and the guitar. After working for over a year and a half on a compilation of Christmas tunes to be learned and played by acoustic instrumentalists, Fretmentor has just released “Fretmentor’s Acoustic Holiday“. What is special about this collection is that the music is written for all acoustic instruments and even the lyrics are included for each selection. Since the music is in both standard musical notation and tablature, no one is left out in the cold. Fiddle players can learn the same tunes as the mandolin player. An entire band can learn each piece and play together, since music is standardized for each instrument. The collection can be purchased at www.fretmentor.com. You can contact David (Insert @ Symbol) Fretmentor.com for instructions on how to pay for the materials. Once you make payment, you will receive Christmas member authorization to download the Christmas songs right to your computer the same day No waiting for mail delivery mail of your materials. In addition, by downloading the free Tef viewer, you will be able to play the entire song in a computer generated midi format. This is perfect for learning the song at your own pace. In fact, you can even slow the tempo of the midi file or repeat a given section while you are practicing. So what are you waiting for? Go to www.fretmentor.com and order the entire collection. After all, Christmas will soon be here and you can be rest assured that someone is going to request you to play a Christmas tune at that next holiday party of yours. This entry was posted in Banjo, Fiddle, Fretmentor News, Guitar, Mandolin, Uncategorized and tagged Acoustic Christmas Music, banjo christmas music, fiddle christmas music, Fretmentor's Acoustic Holiday, guitar christmas music, mandolin christmas music. Bookmark the permalink. 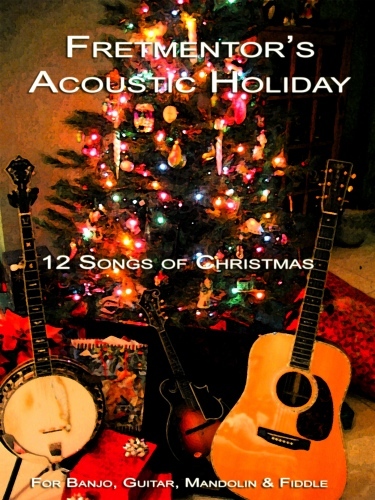 This is the best arrangement of x-mas music I’ve seen for the accoustic guitar. The arrangements are good and generally well designed to play (mostly out fo the chord forms). The tef viewer function is new and makes it easy to play along at any spead and to slow down and repeat tricky riffs or changes. Winter Wonderland and O Holy Night are my favorites. The Christmas Song (Chestnuts roasting on an open fire) sounds great, but is probably the most complicated song on the CD. This is a great learning tool for Christmas music for the guitar. The tabs that you can print out are easy to read and can be printed out to include standard notation, tablature for your preferred instrument, or both. As mentioned above, it is really easy to play the tefview app at any speed so you can hear what the song is supposed to sound like or, better yet, play along with it. The arrangements from Fretmentor range from relatively easy (Away in a Manger) to challenging (O Holy Night), but all are doable with some applied practice (my favorite to play right now is Jingle Bells). It will make a great stocking stuffer for an aspiring musician you know.